Gaylord F. Pierce, born April 3, 1919, in Sac City, IA. 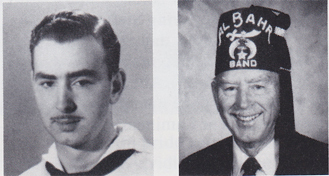 He enrolled in the Navy School of Music Sept. 26, 1940, and was assigned to the USS West Virginia Band in May 1941. During the attack on Pearl Harbor, he helped pull the wounded from the water and took them ashore in a Red Cross Rescue boat. He later went back aboard the ship to fight the fire. When that task became hopeless, he jumped overboard and while swimming to shore, looked back just as the USS West Virginia sank into the water. He was discharged Nov. 8, 1946. Pierce earned a BS degree in business administration at San Diego State University and subsequently his CPA certification. He retired from Cubic Corp. as tax administrator, Nov. 1, 1982. He and his wife La Rue have two daughters and one grandson. Pierce passed away Feb. 20, 1995.